Many people assume there is a secret formula to getting stories on TV or in the newspapers. If that were the case, the formula would have been hacked and posted on the Internet by now. It’s also not about who you know, which many outsiders assume. Yes – a friend in the media can help you by guiding or framing the story, but if you don’t have a solid idea, they won’t run it on the news – no matter how close you are. A more successful media strategy is identifying the strongest narrative with an angle that is creative and unique. As an Executive Producer with WNBC in New York, I approved the story ideas from reporters, producers and publicists. I also approved the scripts that came out of our consumer, health and medical units. When I was reviewing these scripts, or trying to identify whether this was a story of interest, I would use these traits to help me guide me. 2) How does this benefit our readers? 3) What is the controversy and does it have a solution? 4) Is there an interactive element we can add? 5) Who else has done this story? 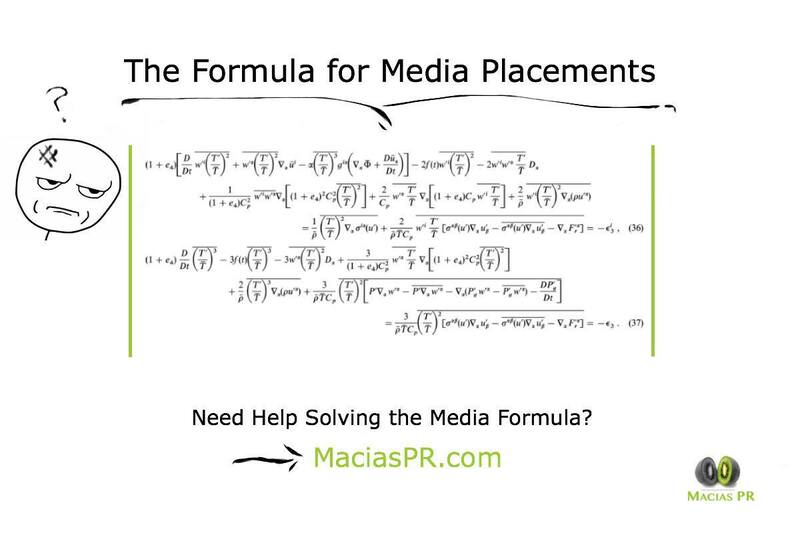 Generally speaking, if you can craft a media campaign around those questions, you will have more success with your media placements. 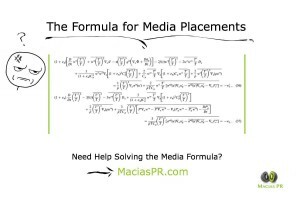 You can also get some guidance by looking closely at the media formula photo we posted above this article. Mark Macias is a former Executive Producer with NBC and Senior Producer with CBS in New York. He’s also the author of the communications book, Beat the Press: Your Guide to Managing the Media, which has been featured in the NY Times, Fox Business, NY Post and others. 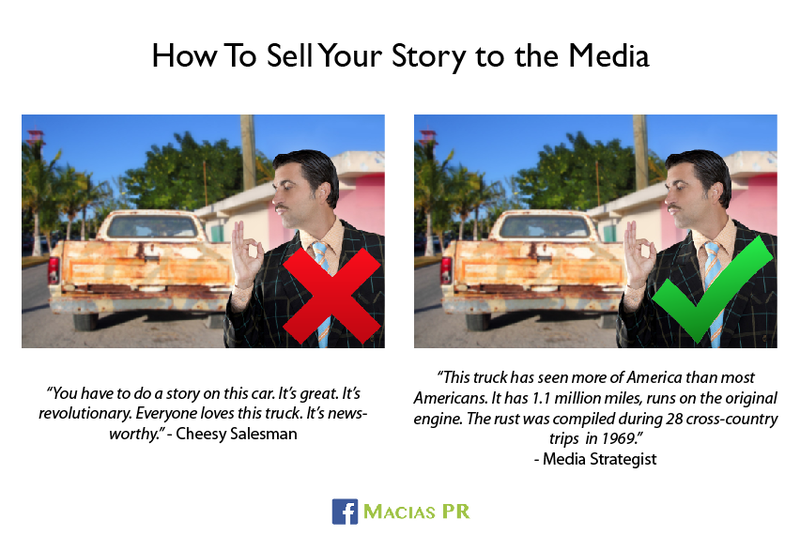 Macias consults small and large businesses on how to get publicity. You can read more on his firm at MaciasPR. It’s not easy finding the right service provider for any industry, but in public relations, it can be even more misleading since anyone can call himself a publicist. So is there a way to weave out the quality from the quantity? And how can you quantitatively measure the value and success of a PR firm? As a former Executive Producer with NBC in New York, I was pitched stories on a daily basis from publicists, reporters and producers. And as a Senior Producer with CBS, I pitched stories everyday to a tough audience of skeptical journalists. Now, as the owner of a PR firm, I see the other side. In my weekly routine, I converse with all kinds of potential PR clients from various industries – finance, tech, service sector, nonprofits. Some of these potential clients are budding entrepreneurs, while others are established CEOs of major organizations. Regardless of the potential client, I am discovering most business owners ask the wrong questions when it comes to identifying the best PR firm for their needs. If I were to hire a PR firm, here are the questions I would want my publicist to answer before I hired him or her. I’m basing this on my media career and my insider knowledge of publicity. Can you give me a publicity strategy for my product? This is a crucial question. You want to see how the publicist thinks on his feet. I’ve asked this question to seasoned publicists for fun to get into their heads. Most of them say, I would need to research it. I believe a great publicist will have his own ideas and be able to identify it based on his experience without researching what others did. How do you see my brand? This question reveals how well the publicist understands your product, platform or service. Make the publicist or PR team explain how they see your product or service. It’s okay if they don’t understand everything at once. I’ve worked with high-tech platforms that took me time to grasp. This is where the publicist should ask questions to get into your product. From this, you will see how well he or she grasps your business. Tell me about your clients and the media placements you have gotten for them? 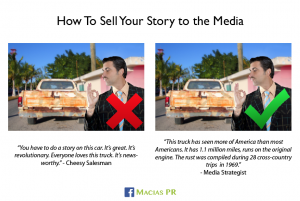 Media placements mean everything in the world of PR. I have gotten my clients big stories in the New York Times, New York Post, Good Morning America, CNN en Español, Fox News, Cosmo, TechCrunch, Entrepreneur Magazine -you get the idea. A diverse portfolio suggests this publicist knows how to identify a narrative, regardless of industry, which is not an easy task. Equally important, make sure the media placements this PR firm has secured are in the same arena of your targeted news outlets. Most of the large PR firms in New York will send their best sellers to get your business, but after they win your account, they will pawn off the work to a 22-year-old college grad. How do I know? Because at NBC and CBS, I used to get emails and phone calls from publicists who were fresh out of college while their bosses tried to win my love with after-work events. Make sure you know who is developing the strategy and representing your company to journalists. What if we don’t get along? This is a great question because relationships matter in business. If you’re working with a publicist and the chemistry is off, you should be able to get a new person on the account. It’s normal to have differences over strategy. I’ve clashed with some clients because they wanted it done their way, but after I explained my strategy and after we delivered strong results, most of them deferred to my expertise when it came to the media. How long before we get to see your results? I’m not giving away my answers to this question, but you should ask it. Experience matters when it comes to anything in life, but it especially matters with the media. Just because your publicist knows how to sell, don’t assume he or she knows how to sell a story to the media. This is a craft and skill that involves a strong understanding of editorial. I would want to hear more about this PR team’s editorial experience within the media. And I’m not talking about, “oh, I’ve worked with this person on stories.” Working with a producer on a story is not the same work as actually producing the story. Why are you different from everyone else? Force this publicist to sell him or herself. They are going to be selling you for a living, so you better make sure this publicist knows how to sell himself. 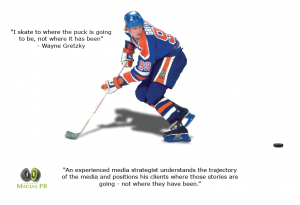 A great hockey strategy is similar to a great media strategy, and it most aptly applies to a phrase made famous by Wayne Gretzky. Wayne Gretzky outperformed others by always understanding where the hockey puck was going before it was even hit. This intuition and feel for the puck gave him an advantage because he didn’t need to pivot. The puck pivoted to him. It’s a similar strategy and approach that also applies to publicity campaigns. During my time as an Executive Producer with NBC and Senior Producer with CBS in New York, I would always hear a familiar phrase in the morning news meeting. No reporter or TV producer wants to pitch a story that is old news, which is why when you are conceptualizing a media strategy, you should look first to the trajectory of the news cycle. What is the news covering now, or even better yet – what will they cover tomorrow? You can always look to today’s news for guidance, but the exceptional media strategist will always be thinking of tomorrow because he knows tomorrow’s story will actually be read today. Think about that for that a moment…….. Imagine the pain of learning you lost 3200 Twitter followers overnight. It was a painful reality for a popular morning TV personality in Phoenix. Tara spent her TV career in Phoenix, promoting that Twitter handle, but she lost control of it because she didn’t own the handle. Tara Hitchcock is unfortunately not alone. I have many close friends in the TV business and many of them associate their Twitter accounts with their current employer. It’s great to drink the Kool-Aid and drop ABC or CBS in your handle, but what happens when you switch employers. These reporters and anchors are harming their ability to brand themselves by giving away their influential Twitter power to the networks. This doesn’t just apply to TV personalities. There are many companies that will create a Twitter or Facebook account for any small businesses and for free. They even will help grow your fan base for a small fee, but when you read the fine print, you will see that you don’t own the Facebook page or the Twitter handle. You don’t need to be a calculus major to see what will happen when you take your business to another social media provider: you will lose your account. So before you go identifying your entire brand with one employer, or even one industry on Twitter and Facebook, think of what could happen if four years down the road, you decide to take a different path. Use a Facebook and Twitter name that you can take with you. I’m glad I did that during my time with NBC and CBS, which is why you can follow me on Twitter/MarkMacias or on Facebook.com/maciaspr.